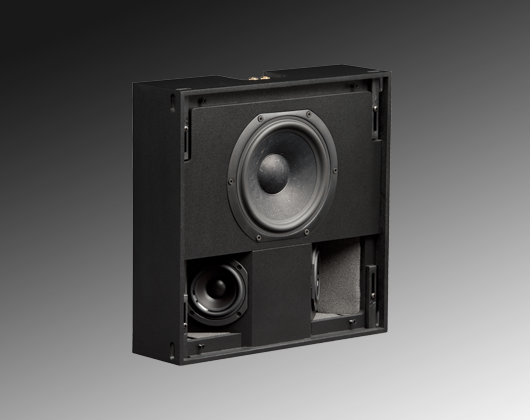 What makes Triad speakers so good. We believe you shouldn’t have to settle for a generic “good enough” custom speaker when there is an innovative Triad product that is perfect for virtually any application. There are other critically important reasons for choosing Triad. The best custom audio products on earth will not make you happy unless the system is properly conceived, designed, installed, and explained. This is why Triad offers exemplary factory support, and is sold only through the best custom installation dealers. The R10 series in-ceiling speakers offer homeowners the refined, musical quality of Triad speakers for their whole home. 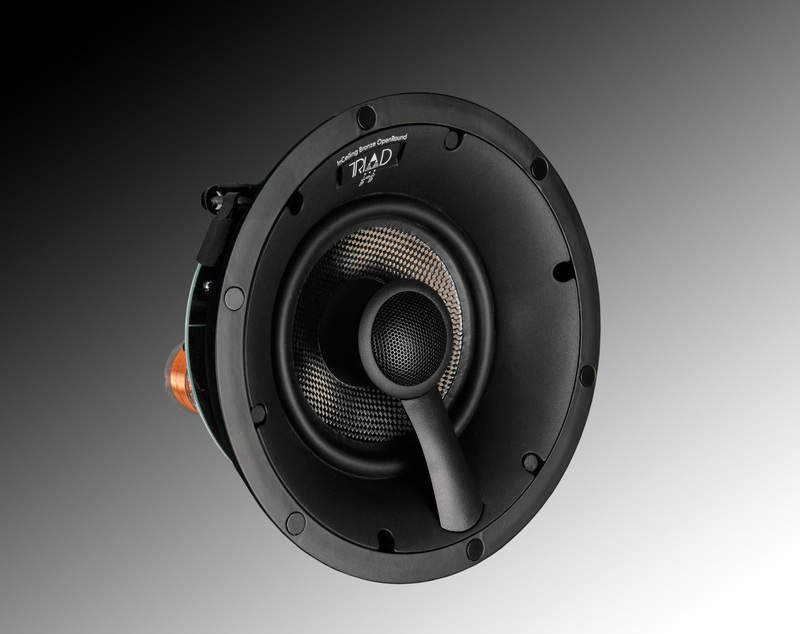 They are built around reinforced Poly-Mica woofers for superior bass and aimable teteron dome tweeters to deliver a full, natural sound and flexible installation options. The four models are voice-matched, allowing homeowners to mix and match speakers to meet the needs of each room while providing identical tonal qualities throughout the home. 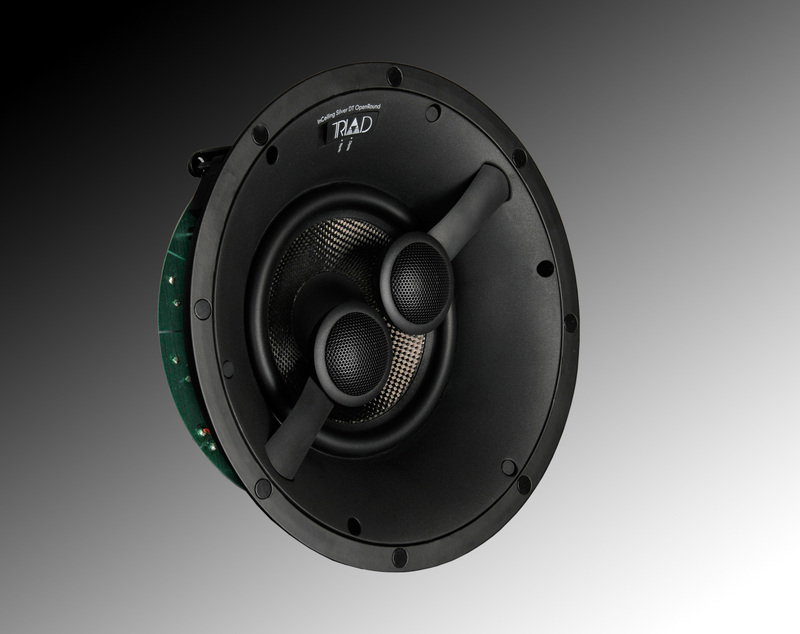 The R18DT version incorporates dual tweeters into a single speaker enclosure, perfect for delivering stereo sound into smaller rooms. R10 speakers ship with white, round, microframe grills that are low-profile and look great. They utilize embedded magnets for fast installation and a snug fit. Custom paint matched round or square grills are available separately and painted at the factory for a perfect finish that blends seamlessly with any interior design. 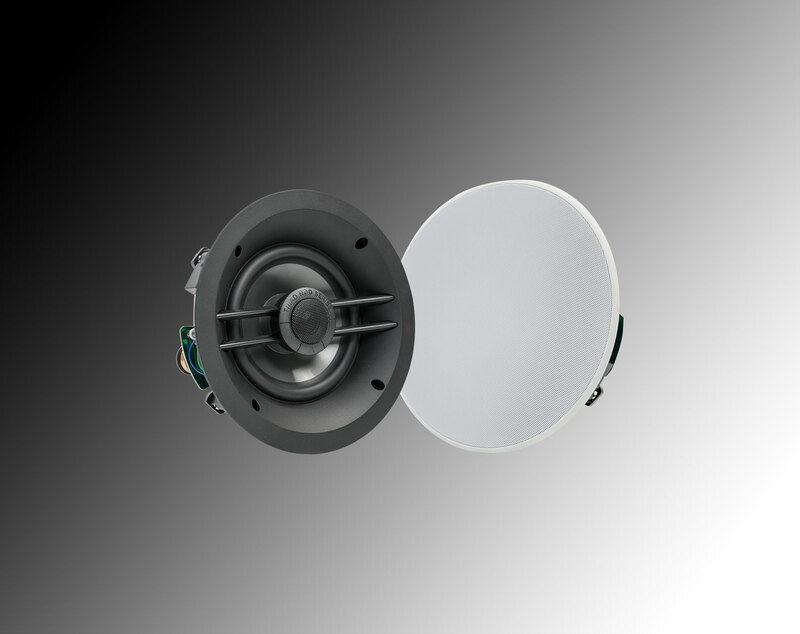 Triad’s entry-level ceiling speaker has a lot to offer at a reasonable price, both in performance and looks. The InCeiling R25 features a quality carbon fiber woofer, and an adjustable and aimable tweeter for greater clarity at the listening position. The classic round shape grill is designer-friendly with a micro bezel. Square shape grill available for an additional fee. The speaker can retro-fit into an existing ceiling, and new construction brackets are also available. Installation is simple and straight forward. Custom paint matching is available from Triad, at a modest cost. For distributed audio installations where sound isolation is not an issue, Triad’s new InCeiling R Series speakers deliver exceptional performance and value with an elegant, unobtrusive appearance. 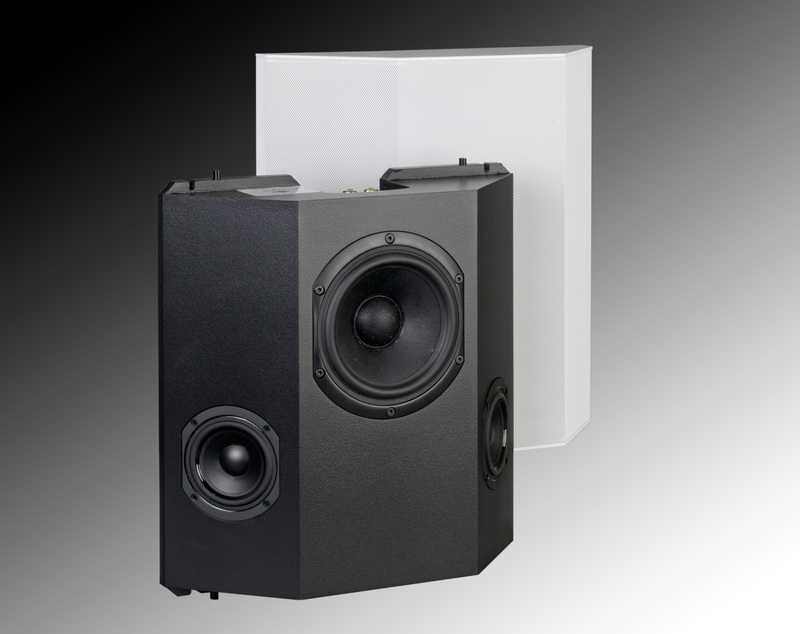 Triad’s entry-level ceiling speakers have a lot to offer at a reasonable price, both in performance and looks. The InCeiling R26 features a quality carbon fiber woofer, and an adjustable and aimable tweeter for greater clarity at the listening position. 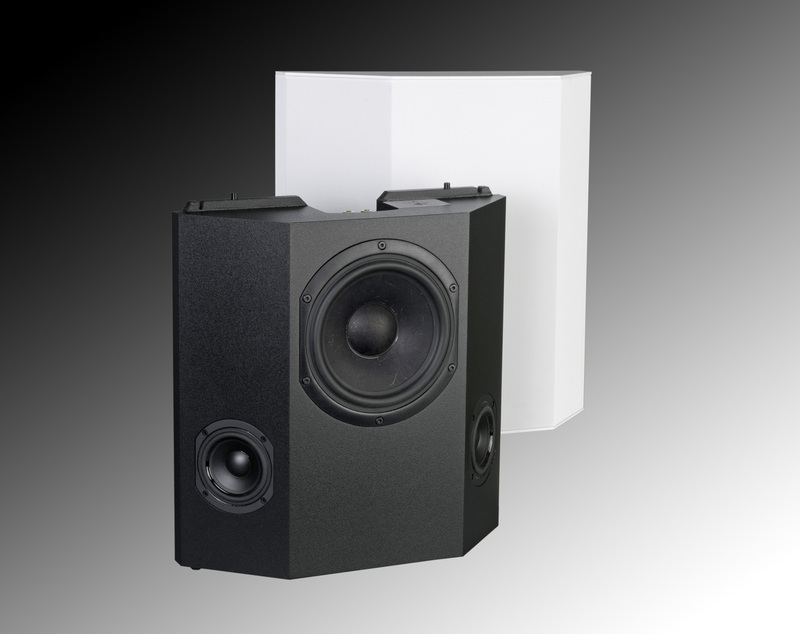 Triad’s entry-level ceiling speakers have a lot to offer at a reasonable price, both in performance and looks. The InCeiling R28 features a quality 8-1/2″ carbon fiber woofer for full bass, and an adjustable and aimable tweeter for greater clarity at the listening position. 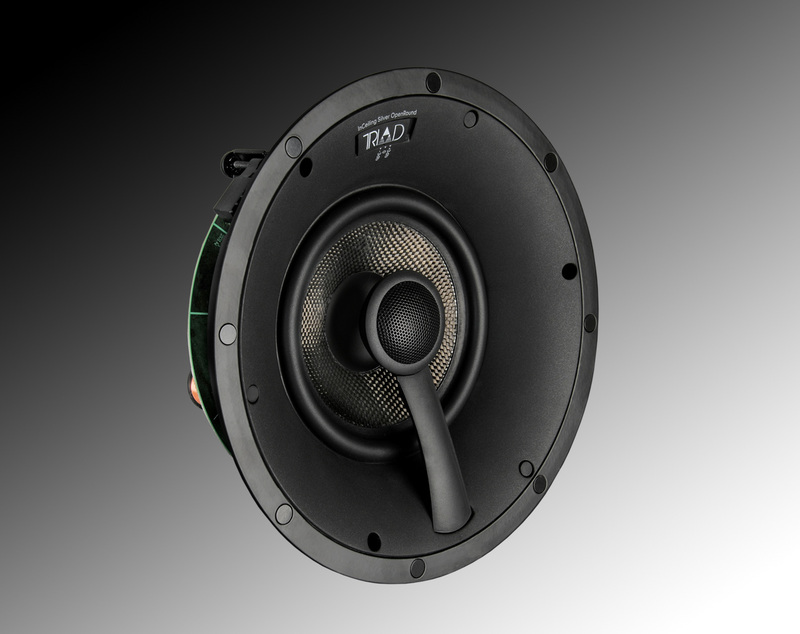 Triad’s entry level open-back ceiling speaker has a lot to offer at a reasonable price, both in performance and looks. The Triad InCeiling Bronze OpenRound features a 5-1/4″ carbon fiber composite woofer, and an adjustable and aimable 1″ fabric dome tweeter for greater clarity at the listening position. The speaker can retro-fit into an existing ceiling, and new construction brackets are also available. Installation is simple and straightforward. Custom paint matching is available from Triad, at a modest cost . For distributed audio installations where sound isolation is not an issue, Triad’s new InCeiling Bronze OpenRound delivers great performance and value with a designer look everyone wants. 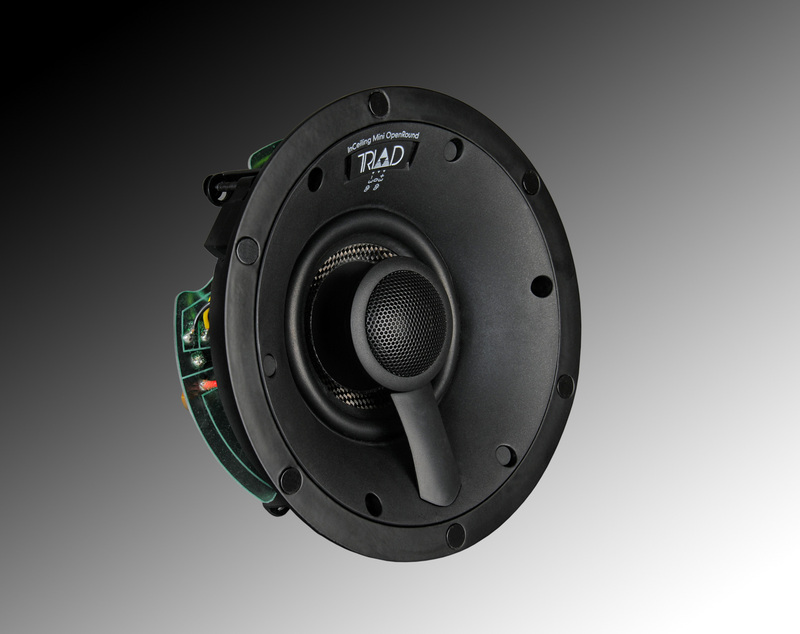 Triad’s largest open-back ceiling speaker has a lot to offer at a reasonable price, both in performance and looks. The InCeiling Silver OpenRound features a cast basket 6.5″ carbon fiber woofer, and an adjustable and aimable tweeter for greater clarity at the listening position. The grill is extremely designer-friendly with a classic round shape and does not use a bezel. Square shape grill available for an additional fee. The grill mounts securely with small magnets which hold it firmly in place, and the grill material is an attractive perforated metal which looks and sounds great. The speaker can retro-fit into an existing ceiling, and new construction brackets are also available. Installation is simple and straightforward. Custom paint matching is available from Triad, at a modest cost. For distributed audio installations where sound isolation is not an issue, Triad’s new InCeiling Silver OpenRound delivers exceptional performance and value with the look everyone wants. 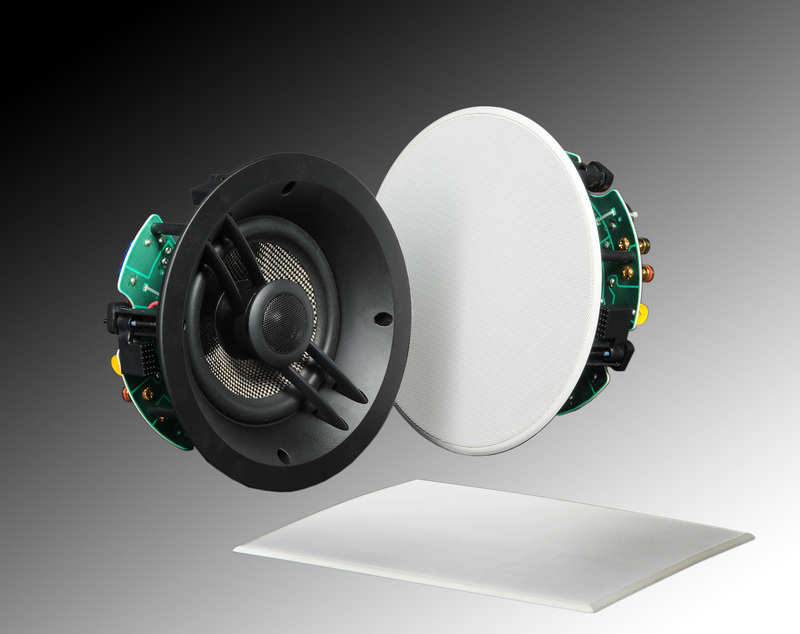 Triad’s new dual-channel ceiling speaker is as versatile as it is attractive. It’s the perfect speaker for special installations such as hallways where it is desirable for each ceiling speaker to play both channels for uniform background coverage. The InCeiling Silver DT OpenRound is also perfect for bathrooms, sitting rooms, etc., where there is only room for one speaker which will reproduce both stereo channels. 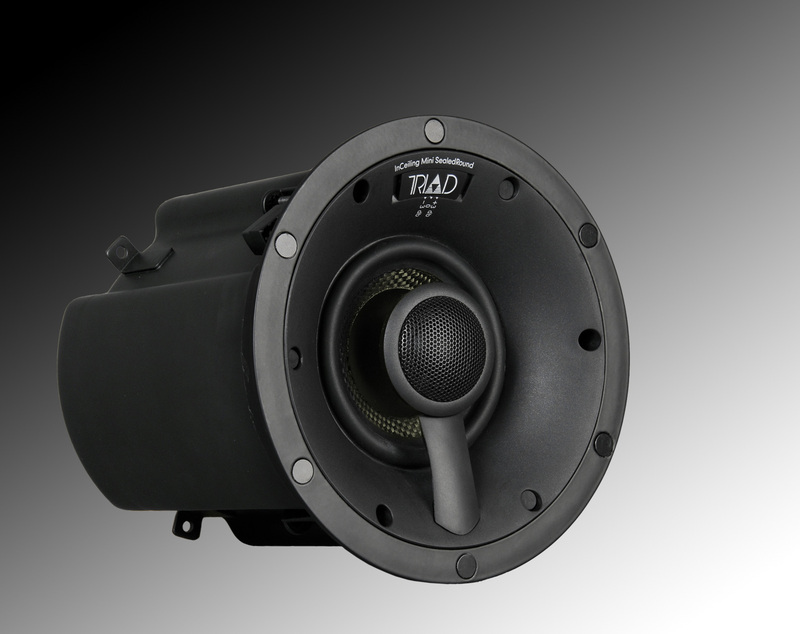 In addition, the DT has switchable tweeter modes, making it either a dipole or bipole speaker, suitable for a variety of surround applications in smaller theater venues. The grill is extremely designer-friendly with a classic round shape and does not use a bezel. Square shape grill available for an additional fee. The grill mounts securely with small magnets which hold it firmly in place, and the grill material is an attractive perforated metal which looks and sounds great. The speaker can retro-fit into an existing ceiling, and new construction brackets are also available. Installation is simple and straightforward. Custom paint matching is available from Triad, at a modest cost. 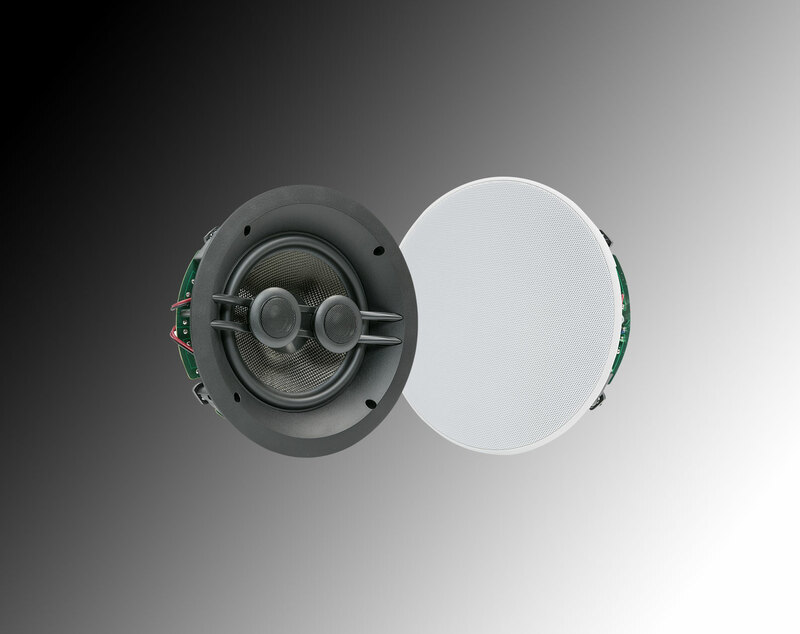 Triad’s entry-level enclosed ceiling speaker has a lot to offer at a reasonable price, both in performance and looks. 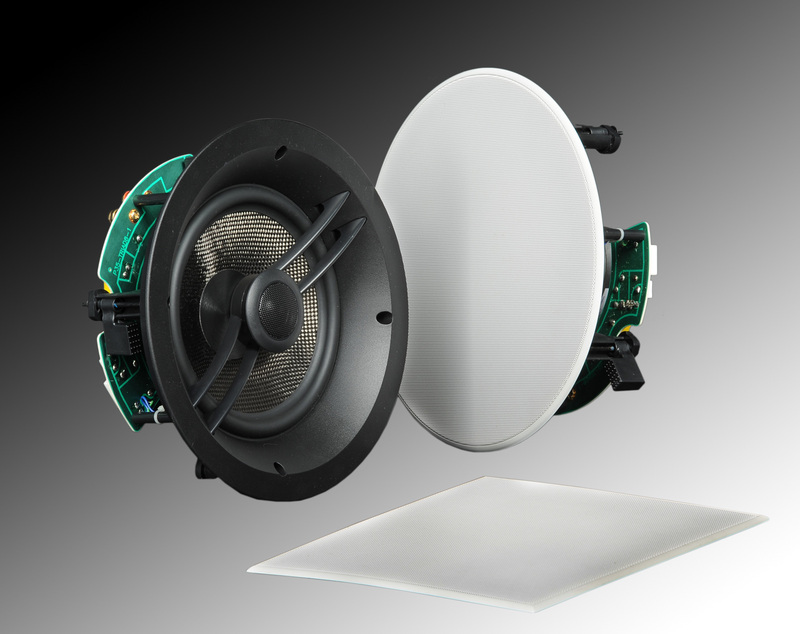 The InCeiling Mini SealedRound features a quality cast basket carbon fiber woofer, and an adjustable and aimable tweeter for greater clarity at the listening position. The sealed steel enclosure offers superior isolation and delivers predictable sound quality every time. The speaker can retro-fit into an existing ceiling, and new construction brackets are also available. Installation is simple and straightforward. Custom paint matching is available from Triad, at a modest cost. 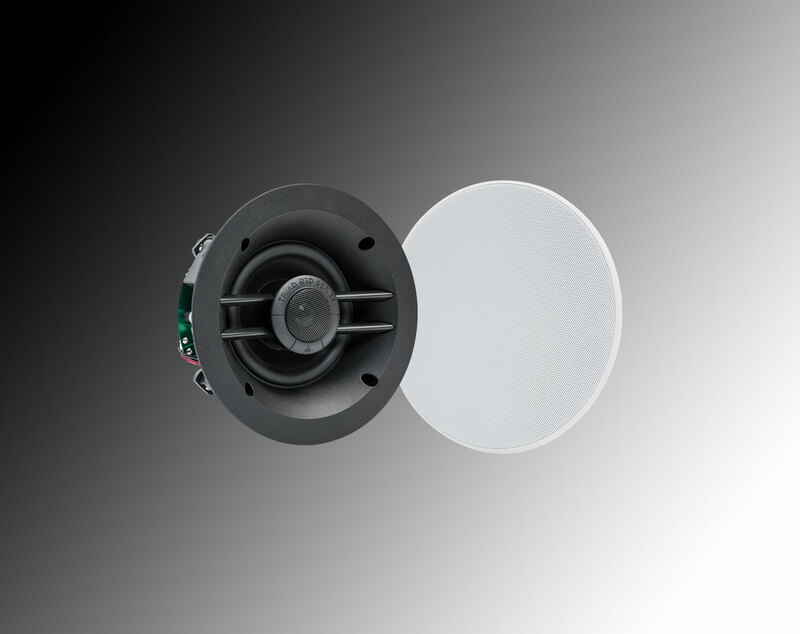 For installations where sound isolation and sound quality are important, Triad’s new InCeiling Mini SealedRound delivers exceptional performance and value with an elegant, unobtrusive appearance. Never before has Triad offered such a reasonably priced and unique solution to the problem of integrating surround sound into a home theater environment. The OnWall Bronze Surround was designed to provide an enveloping surround field when used with better A/V receivers in moderately sized rooms, with both analog and digital sources. While the default configuration is bipole, you can specify your Bronze Surrounds as dipoles if you wish, as they are built-to-order in America, especially for you. This compact surround speaker is available in either black or white, and can be custom paint matched to your environment by Triad for truly invisible sound. When used with Bronze LCRs and Triad Subs, the OnWall Bronze Surround completes the perfect home theater and music system for the enthusiast on a budget. Where surround speakers can’t be built in, the OnWall Silver Surround provides another Unique Solution. The OnWall Silver Surround, a member of the Triad Silver family, provides full-frequency reproduction of analog and digital surround information while blending into the environment. Three premium drivers are used in this innovative bipole to yield high output and a satisfying, enveloping surround field. 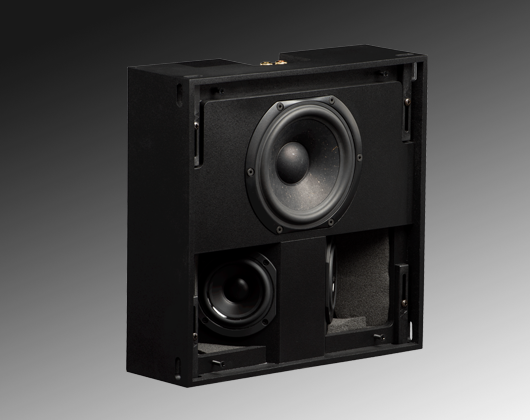 As this speaker is built-to-order in America, you can specify a dipole configuration, if you wish. 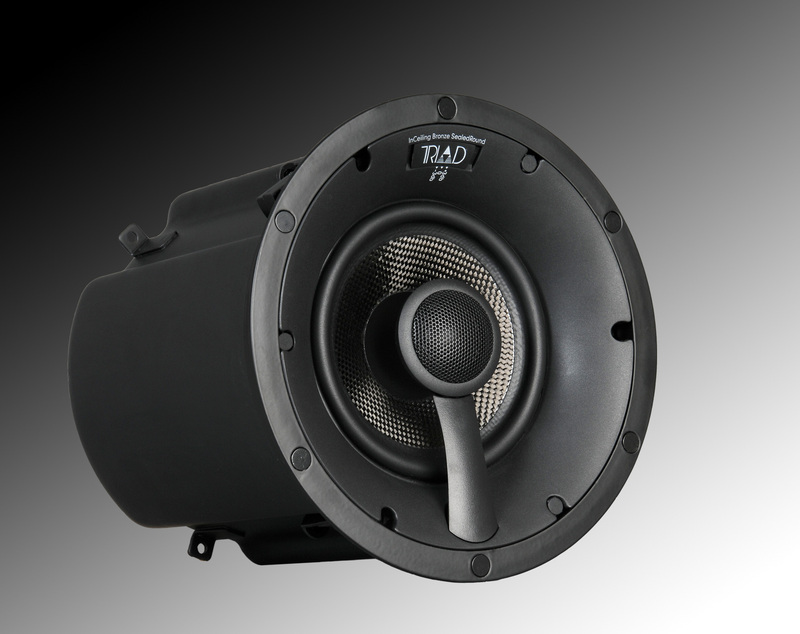 The low profile speaker comes with Triad’s exclusive Acoustiperf grill, and is painted either black or white. Virtually any color can be ordered to either compliment the decor or blend in perfectly with Triad’s Custom Paint Matching Program. The OnWall Silver Surround can be used in arrays of multiple pairs in larger rooms and can be either wall mounted or ceiling mounted to suit the situation. The InWall Silver/4 Surround provides a multitude of Unique Solutions for discrete, creative placement of surround speakers. This 3-driver bipole is the only speaker of its type to feature a flush Acoustiperf grill which can be ordered in any custom color you specify. With its compact dimensions, the InWall Silver/4 Surround can be mounted in walls or in ceiling-mount applications, regardless of the direction the ceiling joists run. In larger rooms, multiple pairs of Silver/4 Surrounds may be used. 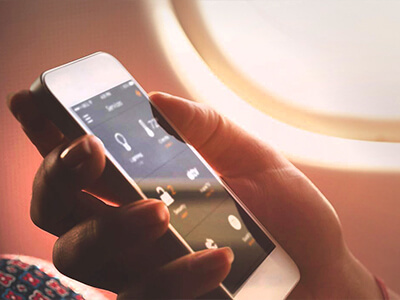 Although dipole mode is the default, the speaker can also be ordered in bipole configuration. It is truly a custom installation dream. This design, with extended frequency response, lends itself well to Digital and DTS soundtracks, as well as Dolby Pro Logic II. High sonic quality, reasonable price, and an ultra-low-profile installed appearance make the InWall Silver/4 Surround the perfect surround speaker for nearly any home theater. 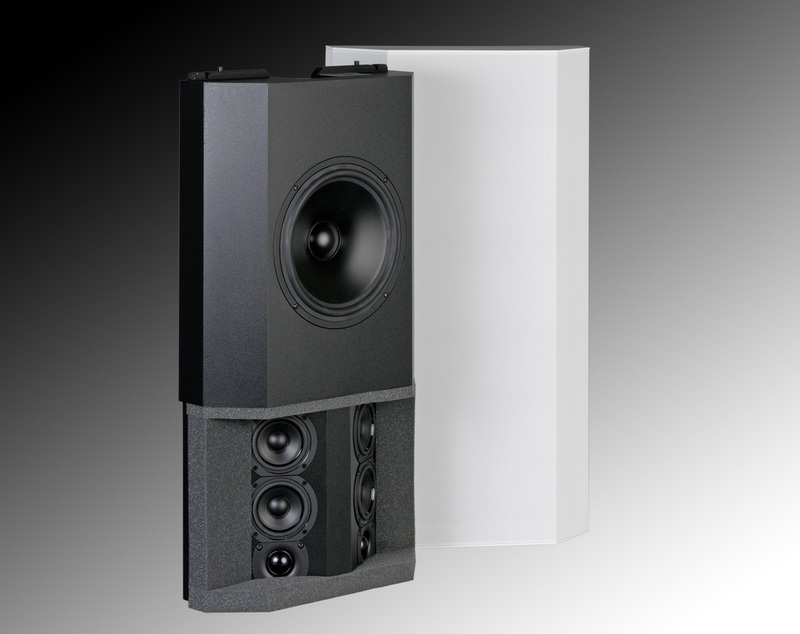 Triad’s OnWall Gold Surround redefines the high-end surround speaker. An impressive seven-driver compliment in a bipole (or dipole, by request) array offers high power handling and high sensitivity, for prodigious output and an enormous surround field. In large rooms or in rooms requiring high output, one or two pair may be used. The OnWall Gold Surround is the perfect choice for surround when used with Triad Gold or Platinum LCRs and Triad Subs. 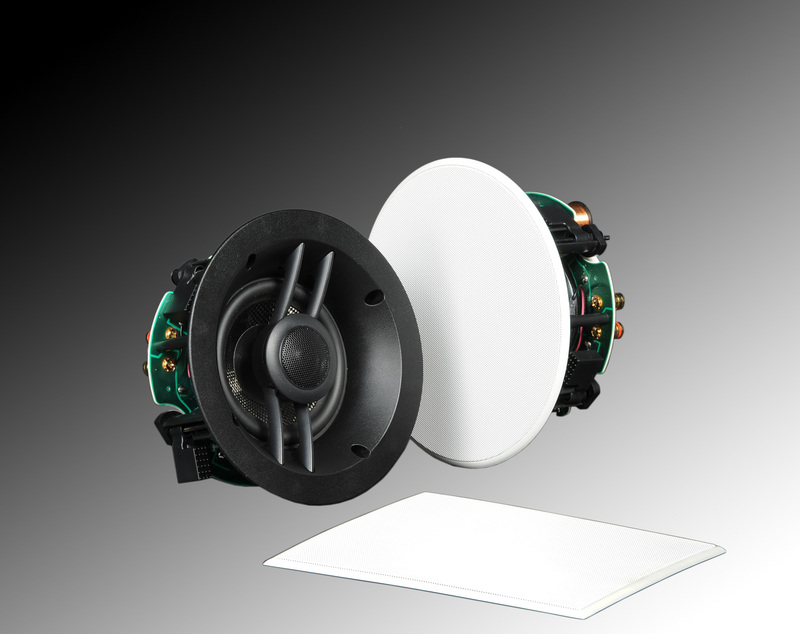 Output is robust; as high as 10 dB more than conventional bipole or dipole surrounds. The handsome Acoustiperf grill extends a scant 5″ off the wall, and the grill can be ordered in any custom color you choose. Not only is the OnWall Gold Surround the benchmark bipole/dipole surround, it also blends seamlessly into your room…sound without compromise! 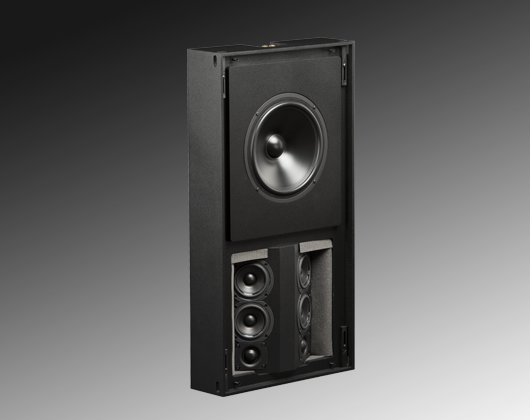 Triad’s InWall Gold/4 Surround redefines the high-end surround speaker. An impressive seven-driver compliment in a bipole (or dipole, if you prefer) array offers high power handling as well as high sensitivity, for prodigious output. One or two pairs may be used in conjunction with Triad Gold or Platinum LCRs and Triad Subs for the ultimate in home theater sound, with effortless reproduction of surround channels, and as much as 10 dB more output than ordinary bipole/dipole surrounds. The design fits flush into a 4″ stud space, and the handsome Acoustiperf grill can be ordered in any color you desire, with your supplied color sample, for seamless blending into your theater area. With the InWall Gold/4 Surround, you can have both the best in sound and the best integration into your room…sound without compromise!